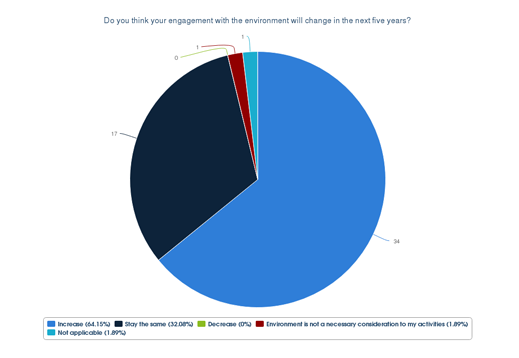 Survey question 8: Do you think your engagement with the environment will change in the next five years? In a recent survey on the future of electronic arts undertaken by Intercreate, 64% of respondents indicated they believe their engagement with environmental issues will increase in the next five years. This is a striking statistic and indicates a rising level of concern among artists, for the environment. Electronic artists most frequently use circuits, digital and computer technology in their work, but rather than the somewhat prejudiced view of geeks and hackers working all hours in technological bunkers, a considerable portion of the electronic arts community is concerned with the very real world issues of the human relationship to the environment. While this may have been speculated previously, the survey results confirm the speculation. The survey was intended to measure attitudes about a range of issues, among the core group of participants and audience around Intercreate.org and it’s Aotearoa-New Zealand based Intercreate Trust. While most respondents (62%) were artists, a further 32% identified themselves as a Creative or Cultural Sector professionals. This is the first survey of it’s type conducted by Intercreate, and further are likely at regular intervals, to track changing trends in the electronic art sector. Data from the inaugural survey is still being processed and it will be several months before the full analysis is complete.